Washington, D.C. – A report released today by the Northeast-Midwest Institute finds the lead contamination problem in drinking water to have a broad geographic reach throughout the Northeast and Midwest (NEMW) region, with more than half of the region’s Congressional districts – spanning cities, suburbs, and rural areas – having significant issues with lead contamination of water. The report also tracked post-Flint legislation and regulations to conclude that state actions have been far from comprehensive, even as they targeted various aspects of this issue. The report catalogs the severity of the lead crisis in the Northeast and Midwest jurisdictions by using a novel, yet established methodology of reviewing news media coverage as a proxy for the severity of drinking water issues related to lead contamination. 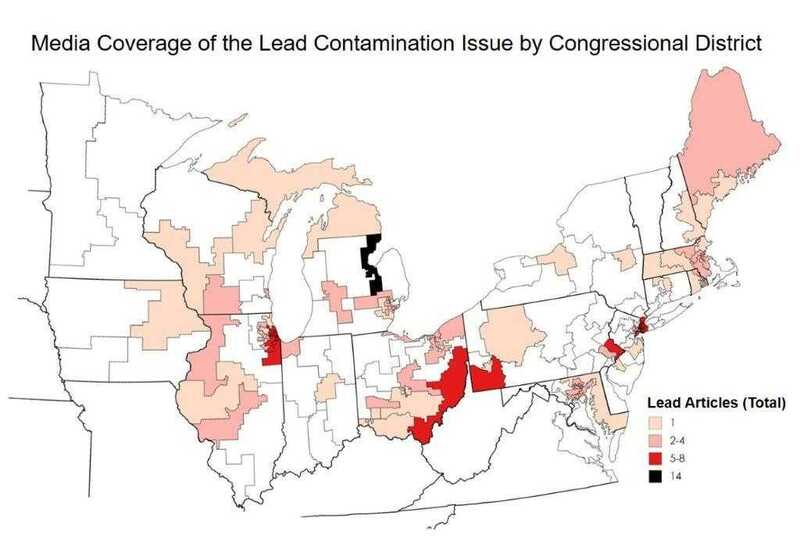 A review of news articles published in the years 2015, 2016, and 2017 found that the lead contamination problem is geographically spread across the region, but most concentrated in a few states such as Michigan, Pennsylvania, Illinois, Wisconsin, and Ohio. The report also found that media coverage of the lead contamination issue was most intense in mid-2016, when the problem was high on the public agenda, but that the coverage quickly receded in visibility, with little to no media coverage of the lead problem in 2017, even though the seriousness of the crisis is just as bad today as before. Additionally, this report presents a comprehensive analysis of post-Flint statewide laws and regulations enacted in the NEMW states to improve water quality, as well as testing, reporting, and notification of lead results, and replacement of infrastructure. In the absence of a strong and proactive federal response to the crisis, states have addressed various aspects of this issue, but a comprehensive approach is lacking. In fact, only three states – Illinois, New Jersey, and Pennsylvania – implemented post-Flint laws that address the lead issue in both municipal and school settings. Four states require lead testing in daycare centers, but only one state – Illinois – covers home daycare centers under that provision. Nearly three years after the Flint crisis, more than half of the NEMW states introduced no new laws or regulations to address the significant problems associated with lead contamination in municipal drinking water. Of the states that did introduce new laws or regulations, with the exception of Michigan, none was comprehensive in nature and instead only addressed certain aspects of this complex issue. Michigan’s overhaul of the state Lead and Copper Rule (LCR) was a commendable policy change, even though it failed to address knotty issues such as financing. In the case of schools, however, Michigan – the state that was and to this day remains the epicenter of the lead crisis – has not moved to make lead testing mandatory, even as half of the states in the region have done so. The recent closure of all water fountains in Detroit Public Schools brings this issue back to the level of a public health crisis, rather than an issue of mere policy inaction. The Flint water crisis endangered the lives of the city’s residents, creating one of the largest public health crises and environmental justice disasters in the U.S. It also awakened the country to the poor quality infrastructure and inadequate safeguards protecting drinking water in American homes, schools, and communities. The NEMW region is especially affected by this issue due to its older cities and aging infrastructure. The Northeast-Midwest Institute’s report draws attention to these vulnerabilities by shining a light on the severity of the problem and policy changes happening throughout the region. This study shows exactly how much work remains in addressing the problem of lead-contaminated drinking water, and should serve as a wake-up call for legislators to spur federal and state action on the issue. The report was supported by a grant from the C.S. Mott Foundation based in Flint, MI, and is available here.